In a medium mixing bowl add the pumpkin puree, egg whites, vanilla, pumpkin spice, cinnamon, banana, protein powder and almond milk. Mix until smooth and completely combined. Add the oatmeal to the mixture and mix again until completely combined. Pour into a greased or sprayed 8×8 inch baking pan or 9×13. Bake for 35 to 40 minutes (less for a 9×13) or until the center springs back when touched. Serve like you would brownies or a casserole. Enjoy! While not limiting yourself is a wonderful, we must also keep in mind my favorite word. It can be quite hard to stick to your normal diet when on the go. There are many obstacles that can appear. These can include but are not limited to, stress, lack of a place to cook, not many great options, time restraints. The lean meats will be a great start, chicken, pork and fish are also good. Obviously a vegetation option would be a good substitute, however the protein content may be a bit lacking. Protein will help keep you satisfied longer than breads or carbohydrates. If possible, get a mixed of carbs, proteins and fats. This will help you from getting all the sweets from the menu. This dinner is fast, easy and healthy. You can use a spiralizer to make zucchini noodles or you can cut them into rounds, which is what I did. In a large bowl combine the ground turkey, panko, egg, salt, scallions, garlic, ginger, cilantro, 1 tbsp of the soy sauce and 2 tsp sesame oil. Gently mix with your hands until combined well. Form into uniform meatballs. Place in little oil in the bottom of skillet. Heat the skillet to medium-high heat and add meatballs. Cover and cook for 15 minutes, gently rotate the meatballs throughout cooking. For the dipping sauce: mix the lime juice, water, soy sauce, and remaining 2 teaspoons of oil in a bowl. Add the scallions and set aside. 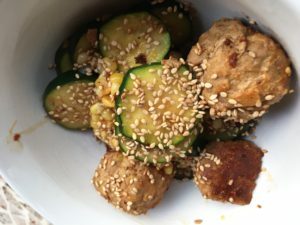 Transfer the meatballs to a serving dish and mix with the zucchini. Stir the sauce, then drizzle the meatballs with a little of the sauce. Serve the meatballs with the remaining sauce on the side. Avocado toast is delicious and good for you. Sometimes it can get a little boring with avocado, pepper and a little lemon. The other day I came across this website with 11 ways to make your toast a little more fun and tasty! Try out one or all the options! Easy ways to make this healthy snack more exciting each time you eat it. Here is a healthier take on a pretty tasty dish. It omits mayo and replaces it with avocado. Served on bread or toast it is quite the tasty treat. Feel free to get creative, add hot peppers for some spice or bell peppers for color. Don’t forget it will be green because of the avocado! Mash the avocado with a fork and then add the rest of the ingredients on top of that. Mix well to combine and season to your taste!